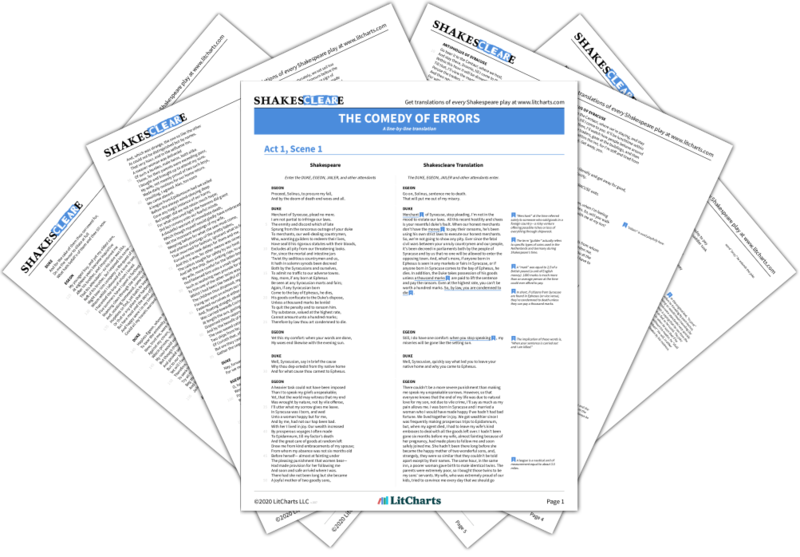 Instant downloads of all 946 LitChart PDFs (including The Comedy of Errors). New! Understand every line of The Comedy of Errors. LitCharts assigns a color and icon to each theme in The Comedy of Errors, which you can use to track the themes throughout the work. Antipholus of Syracuse has found out that his Dromio did indeed bring his money to the Centaur Inn. He runs into Dromio on the street and asks him about what he was talking about earlier. Dromio is confused and says he hasn’t seen his master since he was sent to the inn. He thinks Antipholus is joking, but Antipholus beats him, showing that he is serious. The confusion continues, as Antipholus finds Dromio of Syracuse and asks him about his behavior earlier (which was actually the behavior of Dromio of Ephesus). Though both characters have made errors, Antipholus puts blame on Dromio, and hits him. Dromio asks why he is being beaten, and Antipholus says he should know. Dromio insists he is being beaten “out of season,” and trades some witty quips with his master. He tells Antipholus a long joke about Father Time and baldness, playing on many puns. Antipholus is amused and mostly pacified. Dromio is upset at being abused as a scapegoat, and gets out of further punishment with his quick wit, amusing Antipholus with jokes. Adriana and Luciana enter. Adriana chastises Antipholus, who she thinks is her husband, for claiming not to know her. She expresses her pain at being cheated on and reasons that if she slept with someone else, he would be furious. She says that she is contaminated by his “contagion” of adultery. Antipholus is confused and says that he has just arrived in Ephesus and does not know her. Adriana and Luciana continue to confuse Antipholus of Syracuse with his twin. Adriana’s worries about adultery show some of the potential problems that can happen in a marriage, and in particular the more limited position of a wife. Antipholus insists on his true identity, for now. Luciana scolds Antipholus and says that Adriana had sent Dromio to fetch him for dinner. Antipholus asks Dromio if this is true, and Dromio says he has never seen Luciana or Adriana before. Antipholus calls him a liar, thinking of Dromio of Ephesus, who did bring the message to him earlier. Everyone continues to confuse the situation, as Antipholus, Luciana, and Adriana all think that Dromio of Syracuse is Dromio of Ephesus. Everyone is mistaken, but, as usual, a Dromio takes the blame. Get the entire The Comedy of Errors LitChart as a printable PDF. Adriana continues to speak to Antipholus as if he is her husband, and he is confused. He asks whether he is dreaming, and says that he will pretend to be her husband in order to find out more about what is going on. Luciana tells Dromio to go and prepare for dinner at home. Dromio says he must be talking with “goblins, owls, and sprites.” He talks to Antipholus and they both agree to play along as if they know Adriana. Adriana continues to insist that Antipholus is her husband, and he ends up playing along and adopting this identity for at least a short period of time. Dromio uses the supernatural as a way to explain the strange coincidences and happenings in Ephesus. Adriana says that it is time for dinner, and tells Dromio to watch the house door and let no one come in to see Antipholus. Antipholus asks, “Am I in earth, in heaven, or in hell? / Sleeping or waking? Mad or well-advised?” Luciana, Adriana and Antipholus go into Adriana’s home for dinner, leaving Dromio to watch the door. Antipholus is certain of his identity, but being treated as a different person by others has made him question his sanity. As he illustrates, the recognition of others is an important factor in one’s own conception of one’s identity. Fredericksen, Erik. "The Comedy of Errors Act 2, Scene 2." LitCharts. LitCharts LLC, 3 Apr 2014. Web. 25 Apr 2019. Fredericksen, Erik. "The Comedy of Errors Act 2, Scene 2." LitCharts LLC, April 3, 2014. 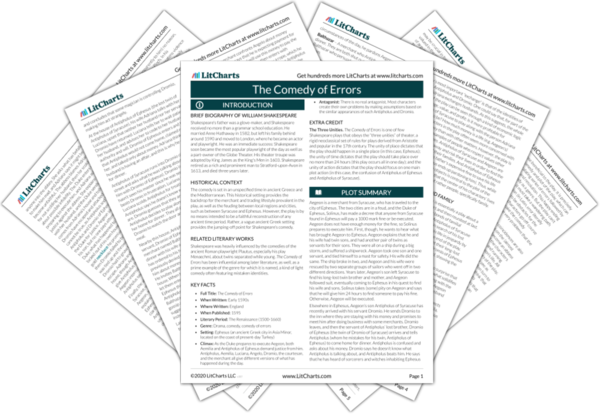 Retrieved April 25, 2019. https://www.litcharts.com/lit/the-comedy-of-errors/act-2-scene-2.